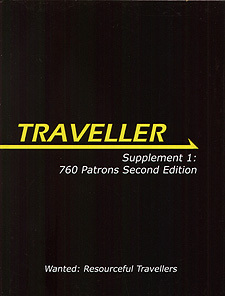 Completely rewritten, the second edition of 760 Patrons brings back adventures, hooks, plot lines and ideas in the classic format of providing an encounter for the players, along with up to six options for the referee as to how the adventure will progress. Got nothing prepared for the next gaming session of Traveller? Your players wandered off into deep space again, far from your planned adventure? Worry not, for 760 Patrons is here to rescue you!